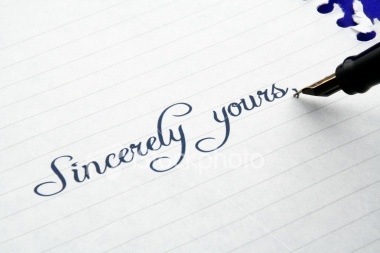 Remember when it was common place to end a letter with the word “sincerely”? This word is rarely even used in our society anymore. It’s been replaced with “regards”, “best regards”, “warmest regards”, “kindest regards”… it’s all the same. Somewhere along the line we changed our scope of practice to simply “a protected interest” or just “attention”. The term is considered to mean respect. It speaks forward — from the writer to the reader. Sincerely is a word that speaks forward a different way. It says something about the character of the writer to the reader. Sincerely says that the writer is being honest and of pure thought. It meant you can trust what the writer was saying. Today, too many people just have regard for Jesus, but they are in no way sincere. It’s the same as believing in him and not doing the things that he says — the Lord himself said that couldn’t be done. Instead, God wants us to respond to his love with obedience. He wants our whole heart and desires to have true worshippers in his presence. This blog asks this very sincere question: Dear reader, are you sincerely following Jesus?